The country was in the midst of World War II, and many of the awards (and the themes of the films of 1942) reflected the country's pre-occupation with the war or the conflict. Some of the nominated 1942 films with propagandistic war themes included Mrs. Miniver, Yankee Doodle Dandy, Wake Island, The Invaders, The Pied Piper, To the Shores of Tripoli, This Above All, and The Fleet's In, to name a few. The Best Picture winner, Mrs. Miniver was an influential film that helped to contribute to the Allied effort. The intense British melodrama was the story of a brave, upper middle class British family (headed by Greer Garson and Walter Pidgeon) struggling during the war with the parents separated. In particular, it provided a picture of a courageous English woman who met the demands of wartime. The film ended with the oratorical words of the vicar (Henry Wilcoxon): "This is the people's war! It is our war! We are the fighters. Fight it then. Fight it with all that is in us. And may God defend the right!" 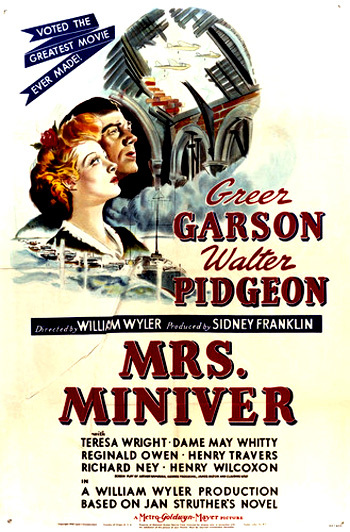 Director William Wyler's Mrs. Miniver, adapted from Jan Struther's series of articles, was nominated with twelve nominations in all the major categories and won six Academy Awards - Best Picture, Best Actress, Best Supporting Actress, Best B/W Cinematography, Best Director, and Best Screenplay (to four writers, one being James Hilton who had written many other novels that became famous films, including Lost Horizon (1937), Goodbye, Mr. Chips (1939), and Random Harvest (1942)). The film garnered Oscar nominations and/or wins in all four acting categories. 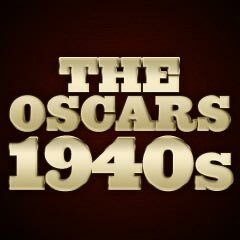 [It was the first film in Academy history to receive five acting nominations.] The Miniver family consisted of the architect husband, played by Walter Pidgeon (nominated for Best Actor), joined by his indomitable wife Greer Garson (nominated for Best Actress for the title role), and their daughter-in-law Carol Beldon (Teresa Wright, nominated for Best Supporting Actress). Both Pidgeon and Garson had appeared as a popular romantic film couple before, most recently in the Best Picture-nominated film Blossoms in the Dust (1941). Pidgeon and Garson would appear in many more films together as husband-wife. Henry Travers and Dame May Whitty were nominated for supporting roles as Mr. Ballard and as the village matriarch Lady Beldon (co-star Teresa Wright's grandmother). William Wyler won his first of three career Oscars as Best Director for Mrs. Miniver - he was eventually to become the most-nominated director in Academy history, with 12 nominations (from 1936 to 1965). This was Wyler's fifth Best Director nomination in seven years - he was previously nominated in 1936, 1939, 1940, and 1941. This was also Wyler's seventh film in a row to receive a Best Picture nomination - and in this year, his film finally won the Best Picture award. Both Greer Garson and Ronald Colman starred in two films nominated for Best Picture in 1942. [Wright was the second nominee in awards history to receive simultaneous nominations in the Best Actress and Best Supporting Actress categories. The first was Fay Bainter in 1938.] Wright won the Best Supporting Oscar - her first and only Oscar - for her Mrs. Miniver role as the ill-fated Carol Beldon, rich daughter-in-law of the Minivers - a two-week-old bride of the Miniver's aviator RAF son (Richard Ney), who was killed during an air-raid bombing attack. Pig Foot Pete, an Academy Award nominee for Best Song, was attributed to Hellzapoppin' though it never appeared in that film. It actually appeared in the earlier Bud Abbott and Lou Costello film, Keep 'Em Flying (1941), and under Academy rules it should have been found ineligible. Although Orson Welles' The Magnificent Ambersons was nominated for Best Picture, Welles himself was denied a Best Director nomination, and its major star Joseph Cotten also went unrecognized. Ernst Lubitsch's brilliant farcical comedy To Be or Not To Be set in Warsaw, Poland with its story of a theatre troupe at the time of the Nazi occupation, with an un-nominated Jack Benny as a cuckolded husband and Carole Lombard, was probably considered too tasteless or offensive, or too close to home for homefront audiences - it only received one nomination, for its Score. (The Oscar for Score went to Max Steiner for Now, Voyager.) Lombard should have received a post-humous award since she was tragically killed in a plane crash two months before the film's release. And Jack Benny gave one of his best (and rare) feature film performances in the film. Director Lubitsch was nominated only twice for Best Director (for The Patriot (1928/29) and Heaven Can Wait (1943)) and went un-nominated for this great masterpiece. Spencer Tracy deserved a nomination for his performance in his first pairing with Katharine Hepburn in Woman of the Year. And Errol Flynn was snubbed for his role as heavyweight boxing champ "Gentleman Jim" Corbett in Gay 90s San Francisco in director Raoul Walsh's light-hearted biopic Gentleman Jim. Neither Cary Grant, Ronald Colman, Jean Arthur, or director George Stevens were nominated for The Talk of the Town. And the great film noir This Gun for Hire with a star-making performance by Alan Ladd as killer Philip Raven and Veronica Lake, and director Jacques Tourneur's creepy Cat People with Simone Simon as the mysterious Serbian-born fashion designer, lacked any Academy recognition. One of Ronald Reagan's best performances was in this year: his unnominated role as a farmer's rights spokesman in Juke Girl, along with the beautiful Anne Sheridan as his juke-joint hostess/girlfriend. Although director/writer Preston Sturges won the Best Original Screenplay award for The Great McGinty (1940), there were no nominations this year for his superior Sullivan's Travels, with an un-nominated Veronica Lake and Joel McCrea as a Hollywood director. And there were also no nominations for his classic The Palm Beach Story with Claudette Colbert, singer Rudy Vallee and Joel McCrea - a funny comedy about the marital difficulties of an upper-class couple (with a plot stretching from NYC to Florida).